As you can see, it popped-up quite normally. And, with a little butter and some salt, it tasted great! Maybe a little more flavor than store-bought. It strikes me odd that we've let something even as simple as popcorn go by the wayside in terms of flavor and quality. The stuff in the microwavable bags just tastes awful. I've never been able to get used to the chemical after-taste of whatever it is they put on it. Perhaps I should share my recipe for old-fashioned stovetop popcorn. It's cheaper, healthier, and requires no special equipment. 1) Add just enough oil to the pan to coat the bottom. 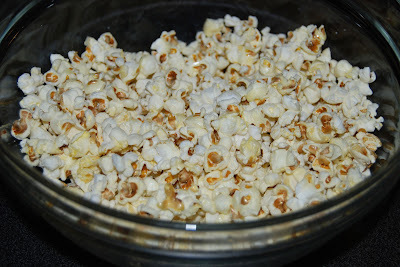 Place three popcorn kernels in the pan, cover, and place it over high heat. 2) As soon as all three kernels pop, remove the pan from the heat. Add enough kernels to form about a single layer on the bottom of the pan. Quickly replace the lid and place it back on the burner. 3) Gently shake the pan to toss the kernels every few seconds. Once kernels start to pop, reduce the heat to medium-high and toss vigorously over the burner to prevent burning. 4) Once the popping begins to slow-down, remove the pan from the heat and crack the lid open slightly to allow steam to escape (but not popping corn!). Let the popping subside. 5) Pour hot popcorn into a large serving bowl. Sprinkle generously with salt. 6) Place butter in the hot pan and swirl to melt it without turning it brown. Place pan over still-warm burner if needed. Once melted, pour the butter over the popcorn and toss well with your hands. 7) Serve, preferably while watching a great movie. I'm a little late on this one, but have you tried microwaving popcorn in a brown bag? A little easier than stovetop, lets you use your preferred kernels, and is open to all kinds of flavorings. It uses less oil too. I've found that anything I add to the bag before popping (butter, salt, sugar, faux cheese powder) sticks to the bag rather than the popcorn, so I just dress it in the bowl.